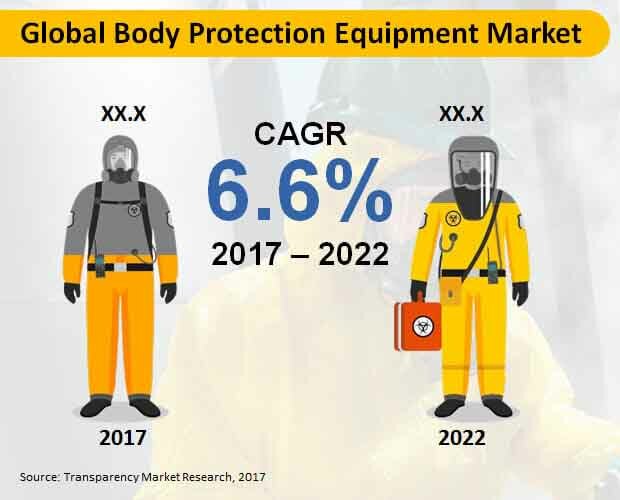 The global market for body protection equipment is anticipated to witness a healthy growth in the forthcoming years, as reported by Transparency Market Research (TMR). The global market features intense competition, with players having to resort to imbibing product innovation and product differentiation in order to multiply sales and gain traction in the industry. Vendors in the market are looking into focusing advanced equipment with better and improved safety for users, which can offer a comprehensive and all-inclusive safety. The body protection equipment manufacturers are additionally looking into the production of wearables that are not only comfortable for the wearer, but also stylish at the same time. A number of vendors are also engaged in business practices such as mergers and acquisition, in order to broaden their horizons. For instance, in 2015, Ansell Limited —a manufacturer of protective solutions—acquired Microgard Ltd., a UK manufacturer of protective clothing, for US$ 88 million, to enhance the company’s body protection business. Some of the prominent vendors in the global body protection equipment are Kimberly-Clark Corporation, E. I. du Pont de Nemours and Co, Honeywell International Inc., 3M Company, and Lakeland Industries, Inc., among others. As predicted by TMR analysts, the global body protection equipment market is poised to exhibit a CAGR of 6.6% over the forecast period of 2017 to 2022. By 2022, the global body protection equipment market is expected to soar to US$ 2,901.4 mn. Among the different application segments, towards the end of the forecast period, manufacturing is expected to be responsible for generating over US$ 700 mn in revenue. The application segment is thus expected to register substantial growth over the coming years. Geography-wise, North America is anticipated to hold a significant share of eth global body protection equipment market, ascribed to the rising incidence of workplace related accidents in the region coupled with the presence of tech giants. Employers have progressively organized laborer's wellbeing and have issued rules for the risky exercises to limit the potential working environment mishaps. These occurrences, if not observed, may acquire misfortunes to the organization as repayments and settlements. There are immense costs identified with resistance of security and wellbeing strategies which is required to ask end -utility areas to put resources into keeping up the body protection equipment stock over the long term. Body protection equipment market is expected to witness quick development over next couple of years, attributable to the strict wellbeing directions concerning the security of workers in several key industries. These enterprises frame a noteworthy contribution towards a nation's GDP and are among the biggest businesses of hands on workforce over the globe. Construction is foreseen to witness fast development over next couple of years inferable from expanding system consumption in countries such as the UK, Indonesia, the U.S., India, and China. Developing requirement for better open system, for example, airplane terminals, harbors, rail transport systems, and roadways is expected to drive the construction industry over the globe. More than half of the fatalities in the construction business is because of tumble from statures. Different occurrences incorporate struck-by-equipment, electric shock, and flawed apparatus which are additionally normal to the assembling part. Full body bridle, chest outfit, wellbeing nets, body belts and suspension belts are the diverse fall protection equipment. Body protection equipment are largely utilized as a part of different application segments, for example, construction, transportation, mining, energy and utility and telecom and other mechanical segment. Among these, fall protection equipment are generally utilized as a part of energy and utility area inferable from their popularity. This is expected to introduce a wide open door for development of the worldwide body protection equipment market in general.